These words to Blessed Maria Celeste Crostarosa from Jesus sum up the meaning of being a living memory of Christ. From her earliest memories she was aware of her special relationship with Jesus. Giulia Crostarosa (later to be known as Maria Celeste) was born the 10th of 12 children in 1696 in the Kingdom of Naples. She was the darling of the family: bright, high-spirited, intelligent, the leader of the brood. But what depths hid beneath the surface: a burning love, humble piety, a pure heart. By 1725, she had entered a religious conservatory in Scala, high above the Bay of Amalfi, and when still in formation as a novice, Celeste had a revelation that she would be the instrument by which a new rule and order of nuns would be established. After a number of years, and with the support and collaboration of St. Alphonsus Liguori, the Order of the Most Holy Redeemer was founded on the Feast of Pentecost in 1731. After much prayer and discernment the Congregation of the Redemptorists was founded in 1732. Ultimately she was expelled from the original monastery for being faithful to her conscience. Celeste lived for five years as a wayfarer like her Beloved Wayfarer, Jesus, who lived among us that we might know the abundant, merciful love of God. During this time she was designated superioress to reform a Dominican convent and take charge of an orphanage. She also gave secret testimony to the Inquisition concerning a spiritual friend. Yet Blessed Celeste’s heart was still set on founding a monastery of nuns with the rule revealed to her by the Lord. In 1738 the opportunity appeared, and she began a second monastery of Redemptoristine Nuns in Foggia, Italy. As a prolific writer and mystic, Celeste was now free to write her autobiography, poems, and spiritual writing known as The Dialogues and The Grades of Prayer. 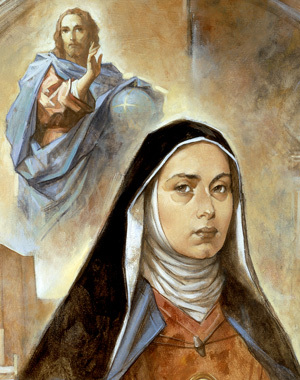 Celeste pondered Christ’s words to her and wrote on topics such as living in the heart of Christ, being living Eucharists for the world, love of the cross, charity and self-abnegation, the Trinity lives in us, and the prayer of breathing love. During the last chapter of Blessed Celeste’s life, St. Alphonsus gave the unheard-of permission to a Redemptorist brother to be the spiritual director of the nuns. St. Gerard Majella not only become Celeste’s soul friend but also brought 12 young women to enter the Redemptoristines in Foggia. In 1762 St. Alphonsus became a bishop in St. Agata di Goti near Naples. Soon he invited the Redemptoristine Nuns to make a new foundation in his diocese. Since then the order, as well as Blessed Celeste’s message of love, joy, and liberty, has spread throughout the world.